Victoria is the southernmost mainland state of Australia. With an area of 227,594 km² (87,874.5 sq mi), it is Australia's sixth largest state or territory. The State is comparable in size to the US state of Utah or the island of Great Britain. 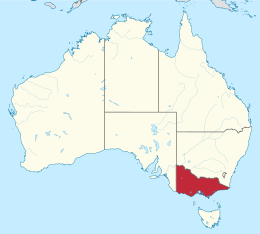 It is bound to the northwest by South Australia, directly north by New South Wales, and also shares a maritime border with Tasmania to the south, across the Bass Strait. Most of Victoria's northern border lies along the Murray River. The eastern half of the state is dominated by the Great Dividing Range and the surrounding uplands, which also to a lesser extent extend far into the west of the state and ease off after The Grampians. By comparison the north and northwest of the state is extremely flat with little prominence. Approximately three quarters of Victoria's population lives on and around the coast of the Port Phillip and Western Port bays, chiefly in Melbourne, in Victoria's South Central region. Centred on the main divide in eastern Victoria, the Eastern Uplands separate the streams and rivers draining north to the Murray-Darling Basin from those flowing southwards directly to the sea. It is the largest and most diverse geomorphic region in the State. The main streams draining northwards are the Goulburn, Campaspe, Mitta Mitta, Kiewa, Loddon, Avoca, Wimmera, Ovens and King Rivers. The most important streams flowing southwards to the sea are the Latrobe, Thomson, Macalister, Mitchell, Tambo, Nicholson and Snowy Rivers and their tributaries. All these rivers, with the exception of the Snowy River, reach the sea through the Gippsland Lakes of south-eastern Victoria. Further east, the Bemm, Cann and Genoa Rivers flow directly into Bass Strait to drain the eastern division of the Eastern Uplands. The Yarra River, flowing into Port Phillip Bay, drains the southwest area of the Uplands. The south-west of the state is dominated by the Hopkins and Glenelg rivers. The longest river in Victoria is the Goulburn, which rises below the peak of Corn Hill (1,331 m) and flows into the Murray river near Echuca. It is over 650 kilometers long. Major peaks on the Great Divide in the Eastern Uplands include Mount Cobberas (1,833 m) near the border with New South Wales, Mount Hotham (1,862 m) and Mount Howitt (1,746 m). Victoria’s highest mountain, Mount Bogong (1,986 m), is just north of the main range on a ridge that separates the upper reaches of the Mitta Mitta River from the Kiewa River. Other prominent peaks are Mount Feathertop (1,922 m), also to the north of the Divide, and Mount Buller (1,804 m) to the north west of Mount Howitt. Mount Wellington (1,632 m) lies at the southern end of the Snowy Range. The highest point south of the main divide is Mount Reynard which lies at an elevation of 1,737 meters. Dendritic patterns of narrow ridges and valleys are typical of the region and characterise much of the deeply dissected landscape on either side of the Great Divide. Occasional isolated summits such as Mount Buller and Feathertop stand above the remnant plateaus or broad ridges. Extensive landscapes of low relief occur at higher altitudes in the form of plateaus such as the Bogong High Plains, the plateaus of Mount Buffalo (about 1,400 m) and the Baw Baw Plateau, which are collectively commonly referred to as “high plains”. Extensive plateaus at successively lower elevations also frequent the further they are from the main divide. These include the Pinnibar plateau in the north-east, Nunniong plains to the south (about 1,200 m), and the Koetong - Shelly, Wabonga and Strathbogie plateaus further north (about 600–1,100 m). The northerly draining valleys widen and the stream gradients gradually decrease as they near the Riverine Plain to the north and west of the region. The lower reaches of these streams have flood plains of fine sediments flanked by several sets of terraces. Alluvial or colluvial formations emerge from minor valleys of small ephemeral streams that drain the interfluves of major valleys. The ridges, as they approach the lowland plains, give way to low hills which mark the later stages of erosion of the upland ridges. The floodplain and terraces of the Murray River at Wodonga indicate the eastern edge of the Northern Riverine Plain and the northern edge of the Eastern Uplands, at which point the floodplain is only about 150 m above sea level, consequently causing the flow of the major river systems in the region to have carved deep, narrow valleys in their upper reaches over time where the gradients are much steeper than along the floodplains. South of the Great Divide the river systems increase in gradient and valley depth, and as they approach the Eastern Plain, having narrower alluviated valleys than those in the north. Large lowland areas enclosed by steep ridges such as the Murmungee basin south of Beechworth and the Dargo area south of the Divide, occur in parts of the Eastern Uplands. These are found where more readily weathered and eroded rocks occur surrounded by resistant rocks. The southern boundary of the Eastern Uplands is the southern extremity of an uneven bench-like platform known as the Nillumbik Terrain, which can be traced bordering the Eastern Plain from near Orbost to the eastern suburbs of Melbourne. The Eastern Uplands extend to the coast from Cape Conran to Rams Head, where the Nillumbik Terrain is absent, and is fringed with coastal sand dunes in parts. Tall, thick forests of Alpine Ash occur on the upper mountain slopes, while the worlds tallest hardwood tree, Mountain Ash, is found at slightly lower altitudes in the west of the region, with a typical variety of mixed-species eucalypts in conjunction with Ti-Tree shrubs composing the remainder of the forested portion of the Eastern Uplands. The high plains are dominated by grasslands, herbfields, and heath communities which are widespread in areas where cold air drainage limits woody plant growth, with sphagnum bogs and fens in permanently wet areas. Snow Gum woodlands occupy the rocky knolls and ridges above approximately 1400–1500 m.
Island Archway on the Great Ocean Road in Victoria, Australia. Taken as a 6 segment panorama showing the surrounding coastline.